Soft Brush Coarse – As an optimum alternative to the use of sandpaper when preparing thermoplastic materials. 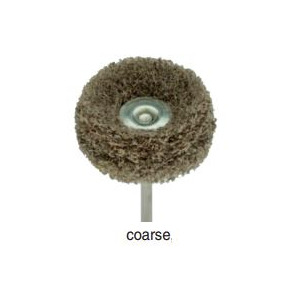 The open-pore brushes reduce the risk of overheating the object, preventing deformation of materials. Application: Preparing the surface of soft relines, mouth guards, vacuum-formed foils, custom impression trays, acrylic dentures, composite veneer crowns etc., to satin finishing delicately prepared precious metal occlusal surfaces.